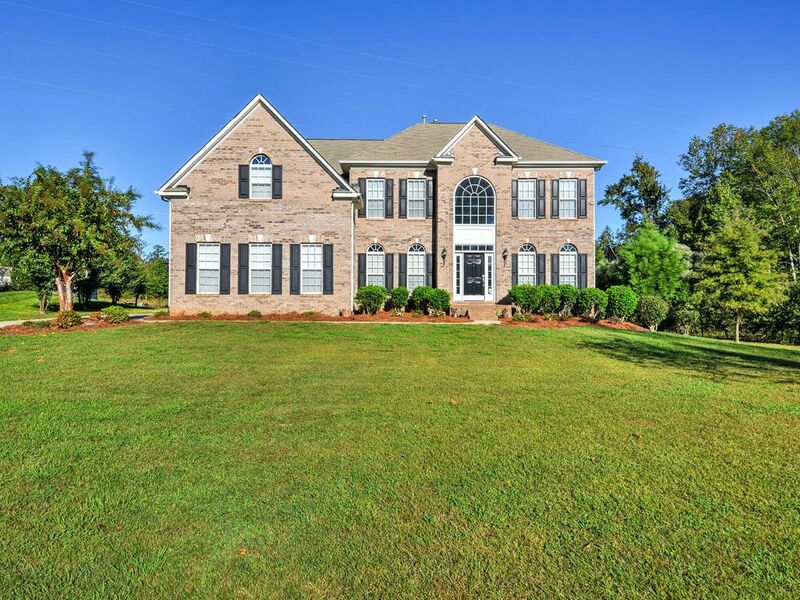 Stately Matthews House w/ Yard - Near Charlotte! A relaxing North Carolina getaway awaits your stay at this elegant 4-bedroom, 3-bathroom vacation rental house in Matthews. The home boasts nearly 4,000 square feet of living space with high-end amenities and room for 6 guests, ideal for a family or group of friends. When you're not hanging out at this welcoming retreat with a huge yard space, you're sure to be out fishing, hiking, or spending a day in Charlotte, less than a 30-minute drive from the property! Upon entering your home-away-from-home, you'll be greeted with a well-appointed interior and soothing ambiance. Brightly lit rooms and an open floor plan make it easy to connect with your companions and spend quality time together during your stay. In the spacious family room, there are 2 comfortable leather sofas and a brand new entertainment center with a flat-screen cable TV. Gather together during a night-in and warm up by the gas fireplace while a movie plays. Just off the living room, you'll find the fully equipped kitchen, complete with a large island and stainless steel appliances. Ample counter space makes it easy to prepare home-cooked meals, quick snacks, and freshly baked sweet treats. When you're ready to retire for the night, choose from one of the 4 lovely bedrooms to drift off to a peaceful night's sleep. The upstairs master bedroom has a luxurious en-suite bath complete with a soaking tub and vanity. Less than a 30-minute drive from the property, Charlotte is an excellent destination for a day trip. Whether you're visiting the art museums, amusement parks, breweries, or parks, there is undoubtedly something for everyone to enjoy. Beer lovers rejoice - there are great breweries nearby that offer tastings and tours for a fun afternoon. Visit Seaboard Taproom & Wine Bar, Carolina Beer Temple, and the Barking Duck Brewing Company. For a family-friendly outing, you'll find Colonel Francis Beatty Park just a mile away, with Carowinds Water Park, the Reptile Zoo in Monroe, or the Lazy 5 Ranch within an hour from the home. Nascar enthusiasts will love visiting the Nascar Hall of Fame and the Charlotte Motor Speedway, less than a 30-minute drive from the property! Pack up a lunch and spend some time outdoors at the Daniel Stowe Botanical Garden, or if you're in the mood for something more adventurous you can try your hand fishing at Squirrel Lake Park, just 10 minutes from the home. This was the first time the family took a trip of this kind; every one under one roof. The house was just as advertised and very accommodating. We really enjoyed our stay and look forward to the next trip! Thanks! Beautiful home. Convenient to Charlotte. Close to areas of interest. Rented the home as a way to get 4 bedrooms without sharing a hotel room or reserving 4 hotel rooms. This experience proved to be wonderful. It was a great way for us to spend more time together (sitting around, laughing, talking, eating, watching TV, etc) rather than going off to out separate rooms. My family and I enjoyed our stay in this wonderful home. The house is warm, spacious and accommodation. The kitchen had everything we need to prepare our meals. Our family truly loved the stately house that really felt like home. We all really enjoyed the rental home for the weekend. Everything was easy to find and easy to use. Carol was great answering my questions. You won’t regret renting this place! The house is large, well taken care of and nicely laid out. The neighborhood is quiet. The kitchen is very well equipped. Everything was very clean. Owners were very nice.